Celebrate Secretariat and the annual Run for the Roses, with the perfect shirt commemorating the greatest Kentucky Derby ever run. When Big Red established a new (and still-existing) track record on May 5, 1973 beneath the Twin Spires of Churchill Downs, it was a pinnacle moment in one of America's great sporting traditions. On the front, this eye-catching tee captures a vibrant Secretariat in full motion as he surged to victory in the 99th running of the Kentucky Derby in the amazing time of 1:59 2/5. 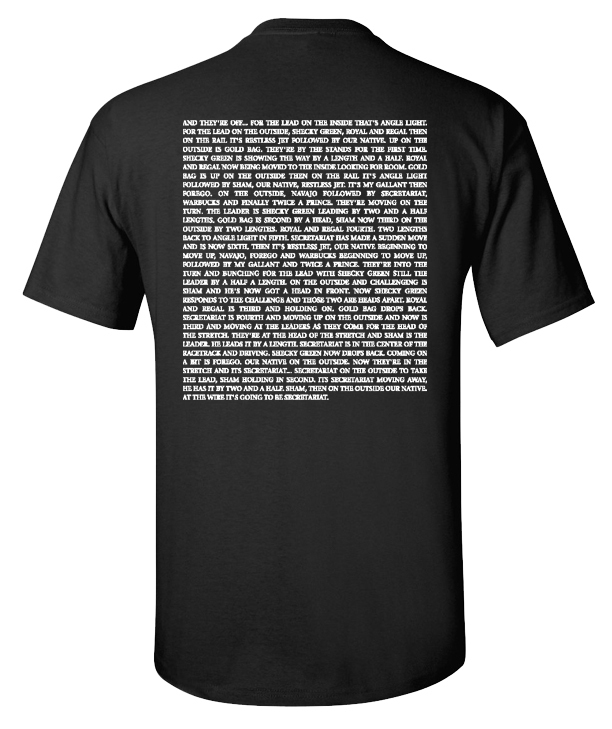 But what really makes this shirt special is the complete call of the race on the back, transcribed in its entirety from start to finish. A perfect gift or souvenir for those who enjoy the heritage of racing history and the memory of the Kentucky Derby's fastest running! Now available in your choice of Black and Heather Royal in 100% soft cotton.